Continuing into the town of Piedmont (an enclave of Oakland) we came to another lovely bridge by John B Leonard. 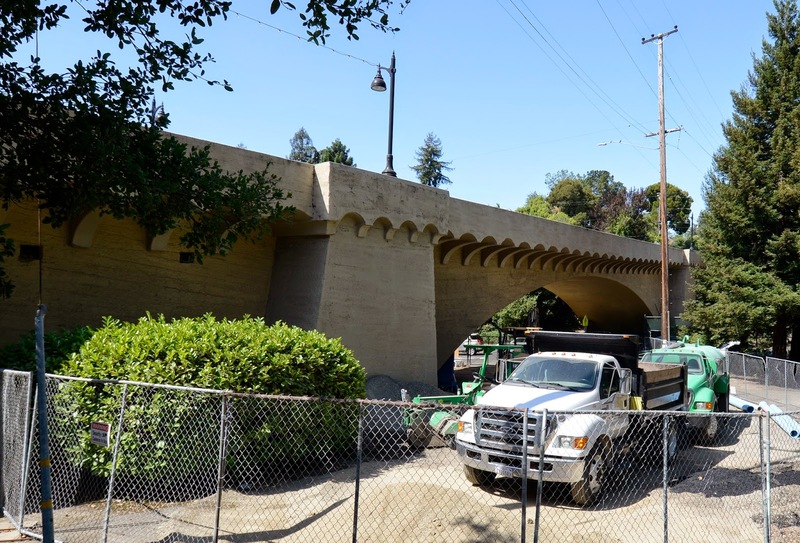 Readers may remember his Alum Rock Park Bridge that we visited in Santa Clara County and his 'No-Hands' Bridge that we visited in Placer County. A good list of his bridges can be found on the Bridgehunter website. The Oakland Avenue Bridge (33C0083) is a 343 ft long bridge with a 160 ft arch span and retaining wall supported approaches. It was built in 1911 but it's apparently not considered a historic structure by the county. The bridge has architectural motifs such as steep walls and overhangs (resembling machicolations) which were once used to prevent entry into medieval fortresses. Alameda County, California Bridges: Oakland Avenue Bridge across Linda Avenue by Mark Yashinsky is licensed under a Creative Commons Attribution-NonCommercial-NoDerivatives 4.0 International License.